Celebrate Oh!K’s birthday this October! This October just got a lot more exciting for K-fans in Malaysia as Oh!K's is celebrating its 4th birthday! 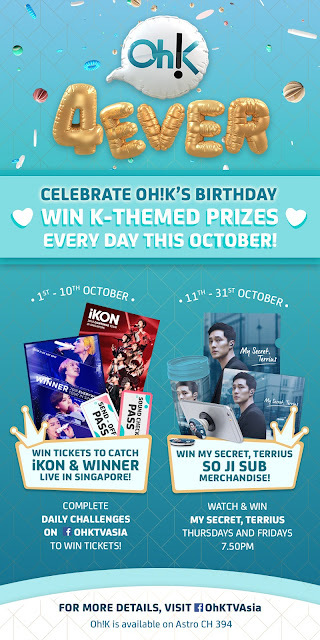 From now until 31st October 2018, Oh!K will be giving away K-themed prizes every day of the month. Firstly, stand a chance to win tickets to watch iKON and WINNER LIVE in Singapore! All you need to do is complete daily challenges on Oh!K TV Asia's Facebook page and tell us why you are Oh!K TV Asia's biggest fan. This giveaway is happening right now until 10th October, don’t miss your chance to get closer to your favourite K-pop idols! Following that, tune-in to My Secret, Terrius every Thursdays and Fridays at 7.50pm on Oh!K Channel 394 to win exclusive My Secret, Terrius So Ji Sub merchandises. This watch and win contest takes place from 11th – 31st October. Together with this, we’ve attached and appended the official visual for Oh!K’s 4th birthday giveaway. Also listed below are two videos to accompany this exciting announcement.